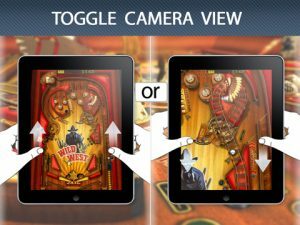 Pinball HD’s three-in-one pinball table game for iPad is, as of now, the best pinball game for the iPad. OOO Gameprom did an excellent job creating a fun soundscape and truly stunning graphics for this version. 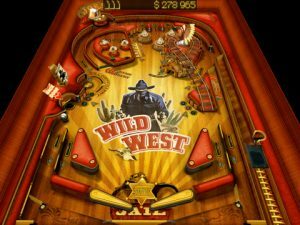 Whether you choose to play The Deep, Wild West, or The Jungle, the detailed table graphics and immersive challenges keep you reeled into the world at hand. Wild West is the most traditional of the three tables, offering up a Western themed table design and a fast moving country and banjo ditty. Challenges integrated into the scoreboard give you simple missions and hitting a specific area gives you the chance to rob a bank or shoot a swiveling Dirty Hairy with the pinball. The jungle theme is completely different. 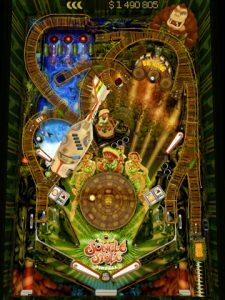 It’s Donkey Kong looking layout features a subtle drumbeat soundtrack, the usual great sounds of the pinball bouncing around, and two sets of flippers for extra fun. It’s fun to watch the ball sail around rickety old wood tracks but even more fun when the game hits the occasional slot machine jackpot as your ball triggers the in-table slot machine to play. 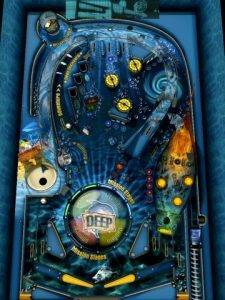 The last pinball theme for this game is The Deep. This game is the most immersive of the three worlds. It features a blue sea theme complete with the opportunity to find sunken treasure. What’s most fun about this version is the women’s voice. Her towering narrative gives the game an element of importance, as well as motivates you to complete her missions. All three tables have a separate appeal to mix things up a bit. Switching between tables is as easy as swiping away from the default Wild West at the intro menu, and you can play in both portrait and landscape mode (though my personal preference is portrait). All said and done, the physics engine is also good and this game is a lot of fun. It’s certainly better than the default pinball that came with computers loaded with Microsoft. Tapping anywhere around the pinball flickers on either side of the screen activates that side and the game ran smoothly. Plus, you can keep your score and upload it to the internet for entry into the Hall of Fame. As far as I can tell, this is the number one pinball game on the iPad. It’s a well made version of the the classic arcade game, both nostalgic and perfectly new. Bottom Line: It’s safe to say that if you’re a pinball fan, Pinball HD is your go to choice for pinball for the iPad.